Have you posted something online or on social media only to regret it later? How about your child? Surprisingly, this frequently occurs as our society becomes increasingly connected with technology and social media. It’s easy to leave a passionate message about bad service at a restaurant or accidentally publicly share a heartfelt private message. Parents are not alone in this tendency to post first and think later- our children are also encountering the epidemic of oversharing. Oversharing can range from innocently posting the school they attend, locations visited, or their class schedule. Little tidbits of information here and there might not appear to be a big deal, but when it’s over social media there is always a chance that someone other than his or her friends are watching. Over time, anyone who is paying attention to a profile can get a strong sense of a child’s personality, habits, and behaviors. In the wrong hands, this can set a child up as an easy target for predators or bullies. It is estimated that 39 percent of teenagers fail to adequately set their privacy settings on social media sites and apps. This is a window of opportunity many predators dream about and begin trolling the profile for information about the child to use later. The danger of oversharing is often scoffed at by teens, because research shows that only one out of four adolescents are concerned about their private information becoming compromised. A teen’s emotional mindset often fails to understand the risks their posts, status updates, and selfies might be opening up them up to later down the road. As parents, we need to inform our children about oversharing to help them safely navigate the online world. Demonstrate how to adjust the privacy settings on social media sites. Stress ways to make a profile private and to only include friends and family with updates. 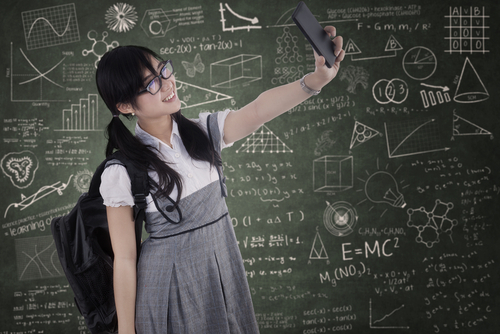 Teach how to scan selfies and photos for clues about their personal information. This can simply be looking for school logos, team names, work uniforms, license plates, and class schedules. Keep cell phone numbers, home addresses, and e-mail addresses off profiles and posts. Stress keeping passwords secret and avoid sharing them with anyone besides a parent. Show ways to use gender-neutral and appropriate screen id’s or user names for social networking or gaming sites. Promote open communication and let children know it is important to tell us if they encounter something that frightens or makes them uncomfortable. Verse a child in social media etiquette and ways to protect their digital body. Abstain from sexting. Sexting opens a person up for legal consequences and bullying. Recommend keeping relationship updates, emotional statuses, or feeling emoticons out of posts. The wrong person could take advantage of these vulnerabilities and cause harm. Be honest that you will be monitoring their cell phone, Internet, and social media activity to keep an eye out for oversharing. Unfortunately, the remedy to defeat oversharing is a not simple fix like logging our kids off social media or taking the charge cords from their Smartphones. Technology is prominent in all of our daily lives and it offers our children wonderful resources for learning and communicating with their friends. With social media and technology being so prevalent in our lives, it important for our sons and daughters to understand the risks oversharing poses and how to avoid common online traps. This is a guest post by Amy Williams: a free-lance journalist based in Southern California and mother of two. As a parent, she enjoys spreading the word on positive parenting techniques in the digital age and raising awareness on issues like cyberbullying and online safety. 10 tips for new parents – but also useful for more experienced parents too!